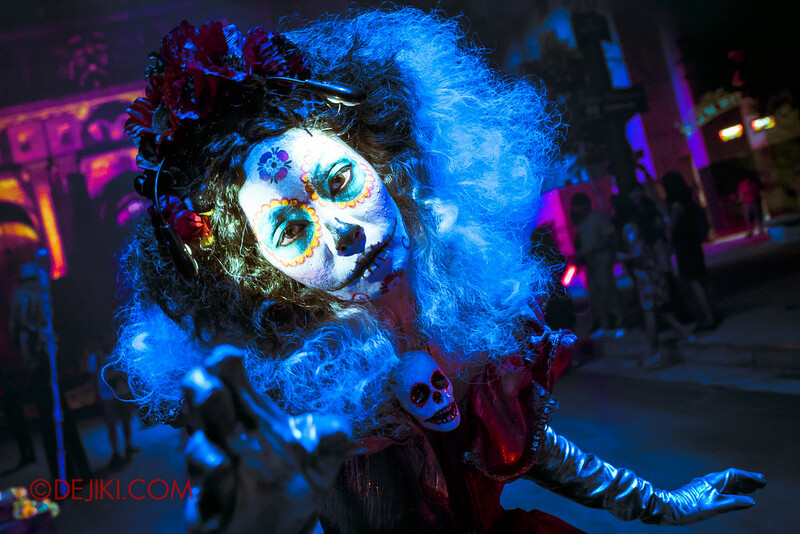 Lady Death has engulfed the world with the darkness within! 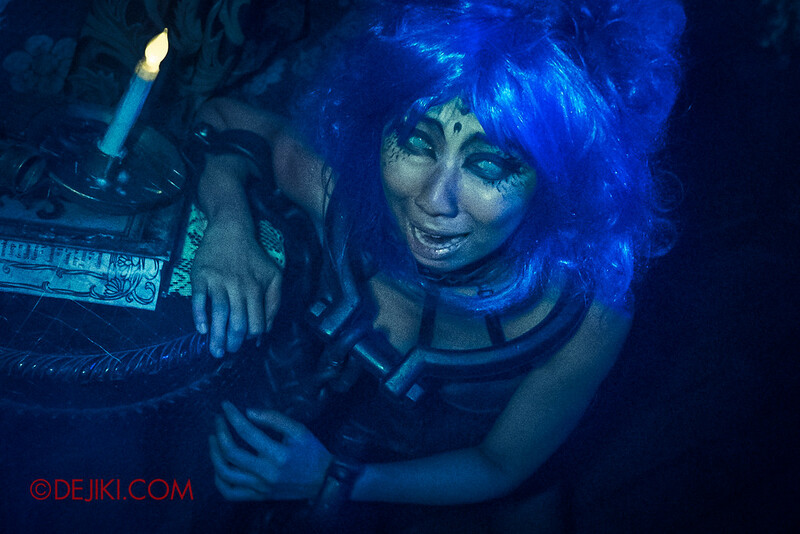 Discover Halloween Horror Nights 6 with photos from all 5 haunted houses and 2 scare zones! 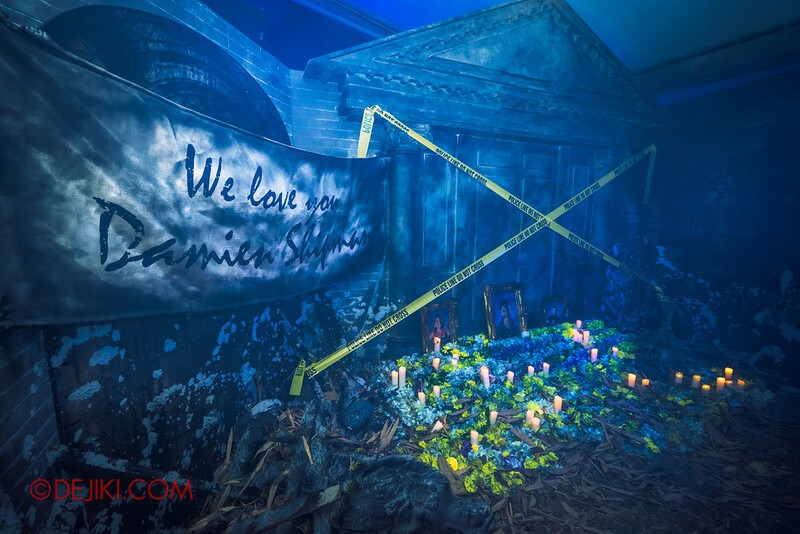 This review showcases many photos of this amazing event – for the ultimate HHN review experience. 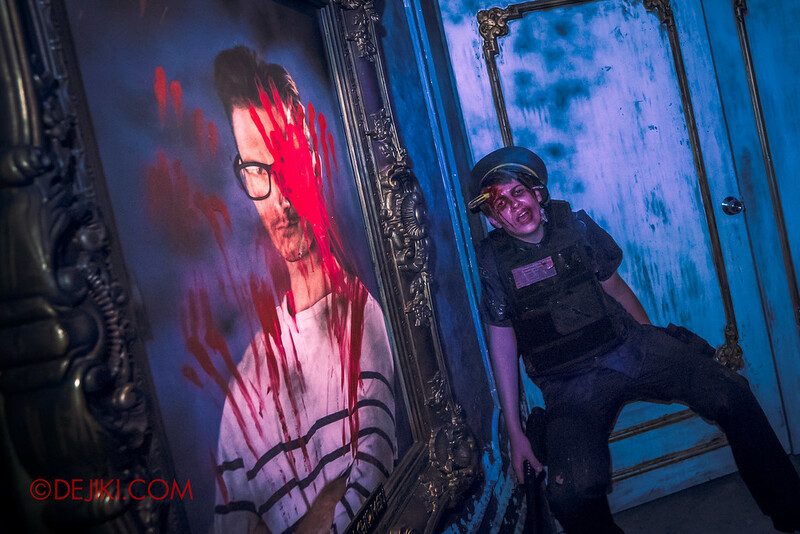 Our rating scores three categories on a 5-star scale: The Story, Presentation (of the overall thematic experience) and Scare Factor. If the attraction exceeds expectations, it would be awarded with bonus blood-red stars. 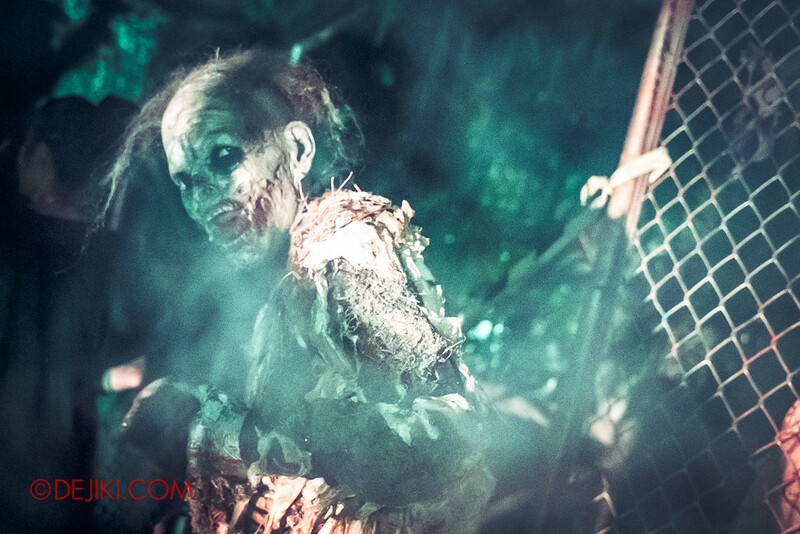 Haunted Houses are enclosed attractions filled with intimate scares and special effects. This year, every house is an expression of the darkness within. 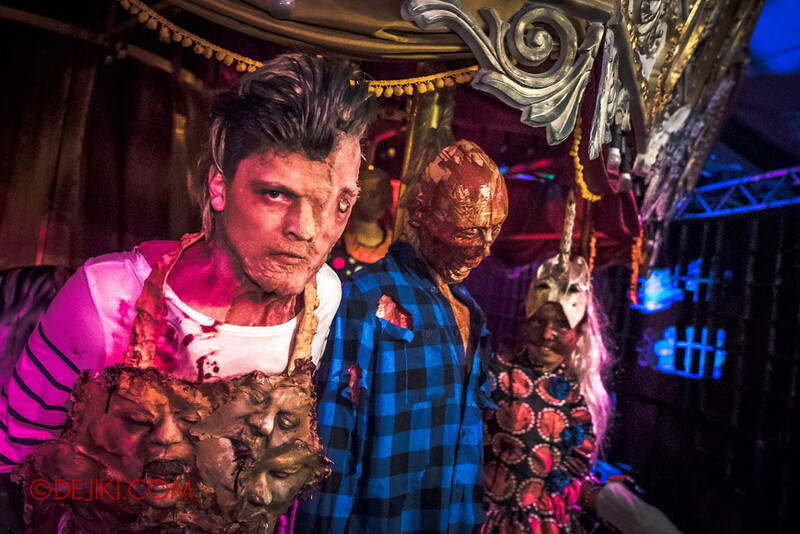 And there’s something about the HHN6 line-up of houses – every haunt has at least one special, memorable experience. 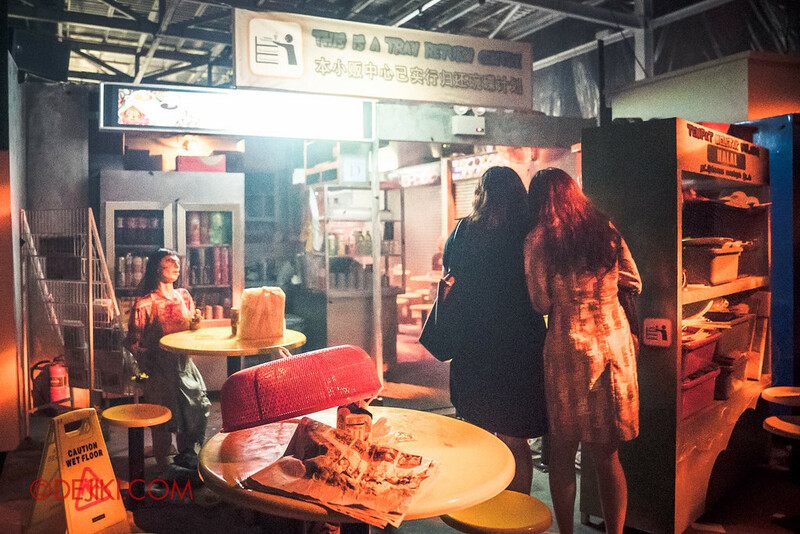 Old Changi Hospital (OCH) fuses many of its famous ghost stories into a gripping nightmare. It is after all, based on one of the most haunted places in the world. If you ignore the old man’s warning and trespass into the hospital, you will start seeing things from beyond, such as vengeful spirits at every turn. Much of the best scares in this house are in the wards. Tread carefully and avoid waking up the tormented patients. 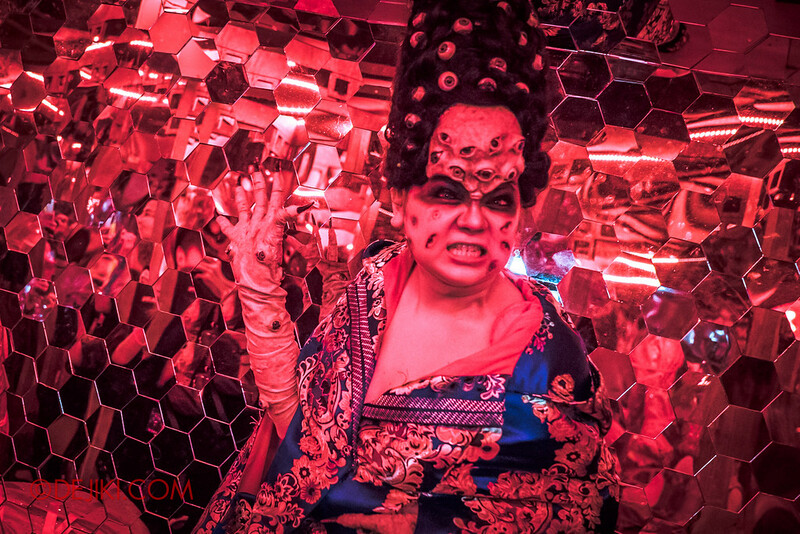 Keep going, and you will stumble into OCH’s torture chambers – where scenes are a concoction of beautifully textured spaces with grisly performances. This haunted house is cleverly designed with many sharp turns and hidden secrets. Apart from those trickery, there’s also clever use of fog, light and darkness – altogether it’s a very exhilarating experience. And so this house is destined to be the scariest of the five. Similar to The MRT (2015), Old Changi Hospital is a compendium of stories presented in a haunted house. 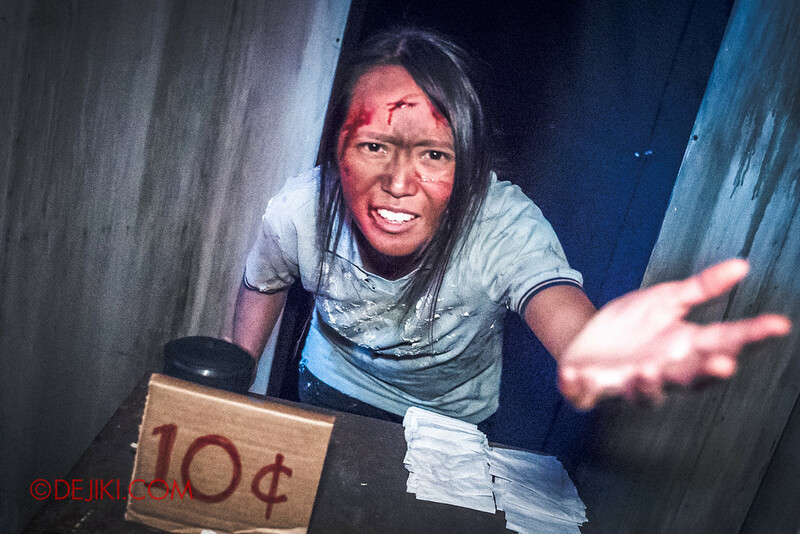 So don’t think you can catch a break as you explore Singapore’s most haunted, because horror never ends. Tip: Not kidding about the hospital ward. Don’t disturb the patients! Showing exclusively at the scorched Shipman Gallery of Art, Damien Shipman redefines art in Bodies of Work. This macabre exhibition is a retrospective on Shipman’s life using unconventional mixed media. The artist lost his family to an unfortunate fire, but the horrific tragedy has inspired some of his most groundbreaking pieces. The entire house is painted blood-red with survivor’s guilt and remnants of shattered memories. And the gallery staff are not spared from the savage terror either. At the very end, Shipman unveils his Masterpiece, a massive kinetic installation that will certainly enthrall. Bodies of Work is a surreal, twisted journey through Damien Shipman’s memories. 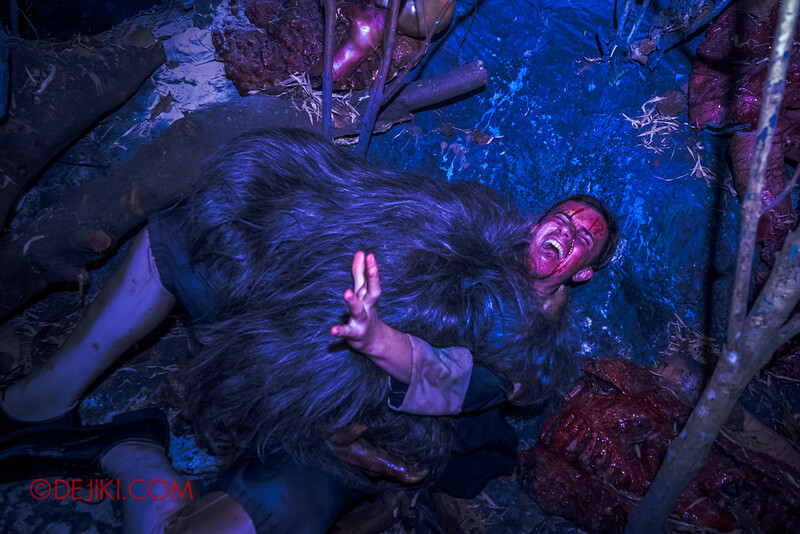 While the amount of gore can be quite terrifying for some, grab your smelling salts and brave through the blood and guts – the experience for the story alone is very satisfying. Setting this up at the Waterworld queue gave the team larger spaces to devise complex distractions, which is a luxury for haunted houses. Fragments of the story are scattered all over the galleries (aptly like the amount of body parts) so you might want to give this house a few walkthroughs to connect the pieces. Tip: Take part in Damien Shipman’s masterpiece, if you dare. The DeFeo witches have awoken, manifesting the darkness within at Salem Witch House. Witness the hauntings in this cursed mansion as you uncover the secrets of Augusta DeFeo. The ‘witchcraft enthusiasts’ that were behind the Witches’ return were quick to regret their foolishness. It’s always too late to turn back… and unfortunately you will have to discover the consequences. Impressively, this is a multi-level (or even multi-dimensional?) haunted house. Be prepared to walk up and down creepy staircases, and try to keep yourself together between rooms. Augusta is watching, and she will share her story through visions of the past. While it can be unclear who the other witches are, hopefully the ones you meet are less cruel. 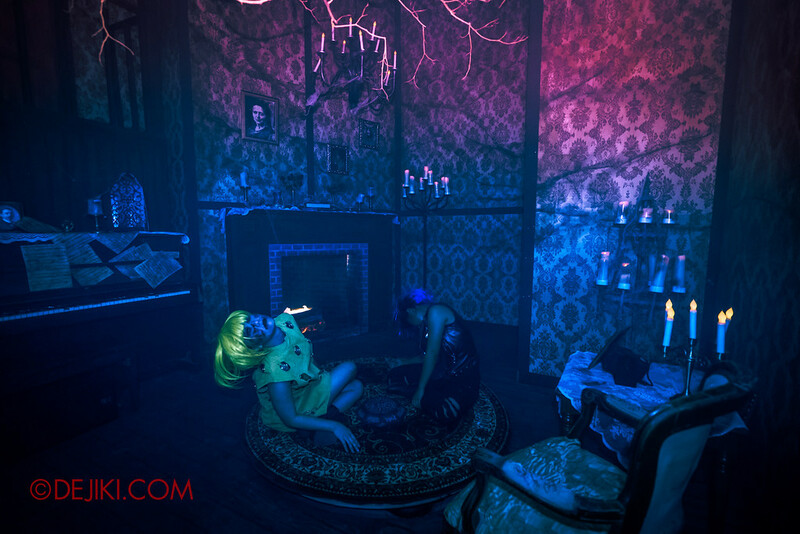 With immense theming and a lot of special effects, Salem Witch House certainly felt like some old house from the centuries past: down to the creaky wooden floors, torn ornate wallpapers, and cloudy mirrors. Augusta the Witch always made us feel like we’re unwelcomed guests – there is always the element of suspense in every room. This house reminded me of Adrift (2013) – from the transitions to the overall attention to detail in its design. Those who remember Adrift will know what I’m talking about. Tip: Look closely at the mirrors. 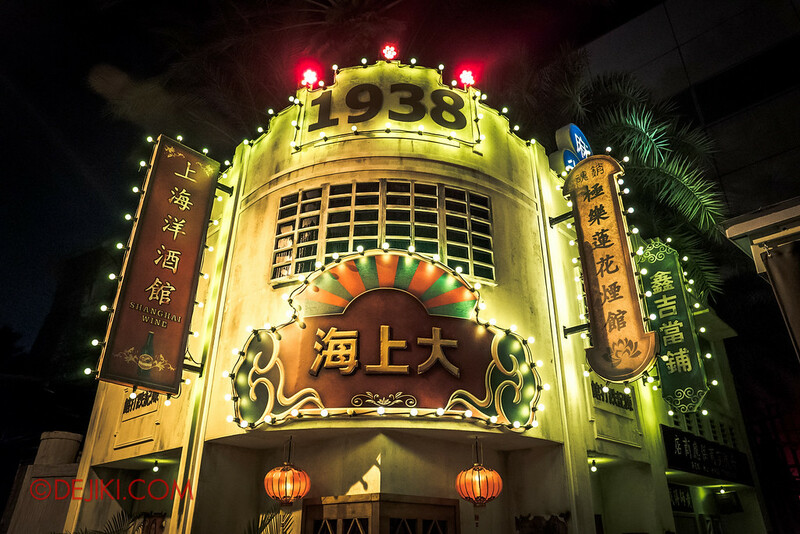 Set in 1930s Shanghai, Hu Li’s Inn is a nightclub operated by shapeshifting spirits, with Hu Li (Fox Spirit) as the prima donna. We’ve previously discovered some of her friends, but turns out this speakeasy is run by a much bigger gang. The club isn’t even at this majestic ‘Great Shanghai’ building. You’ll have to walk around it and go through a seedy alley! 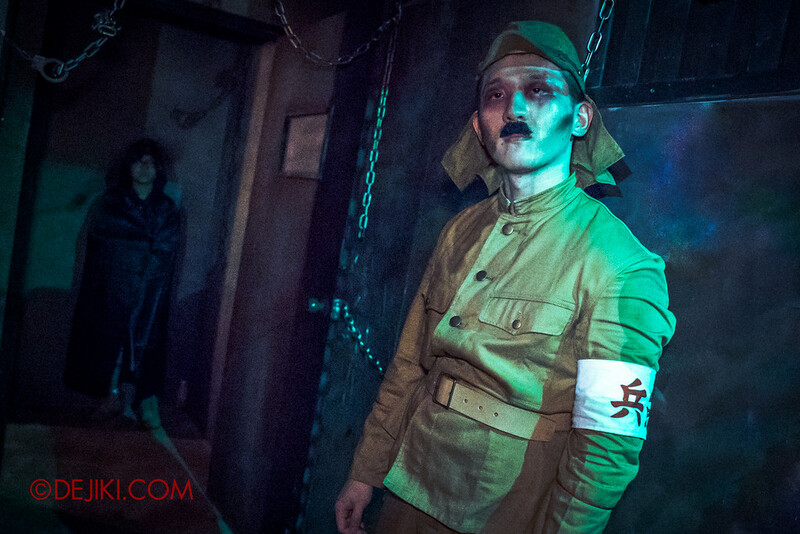 No escape from Madame Hundred Eyes, the mama-san who can see into every man’s desires and lead them to their doom. 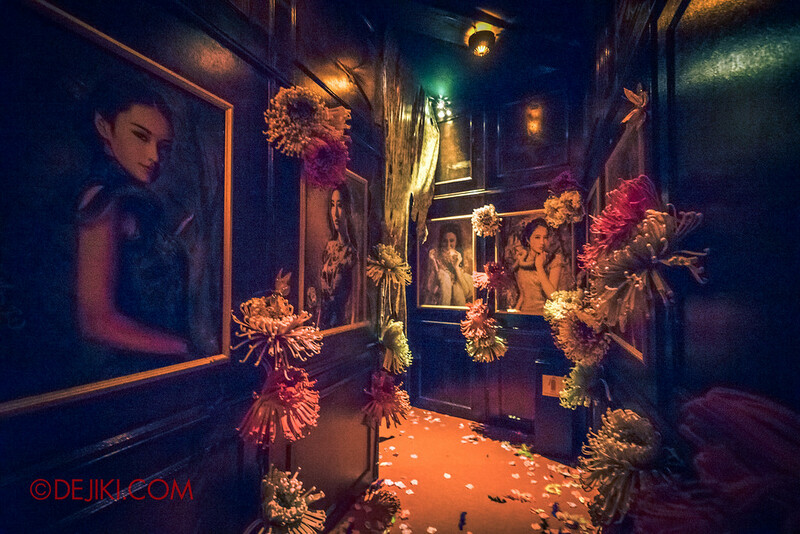 Tales of deadly seduction surround Hu Li’s Inn, and you will get to visit some of the girls – not by choice. Their true forms, while not classically beautiful, are much more sophisticated than the fashion and style typical of Old Shanghai. In the end, you might find that the nightclub’s peculiar location (stuck between Ancient Egypt and Sci-Fi City) isn’t all that random… After all, the whole house is a pop-up conjured by the beastly beings. This haunted house is a crowd favourite during the preview. There are little things that already look strange from the start, and eagle-eyed guests will quickly see through the illusion. Subtle touches make Singapore’s unique houses great, and Hu Li’s Inn, despite having very little space to work with, has its own world of charm – and it could be the house that people will be talking about. 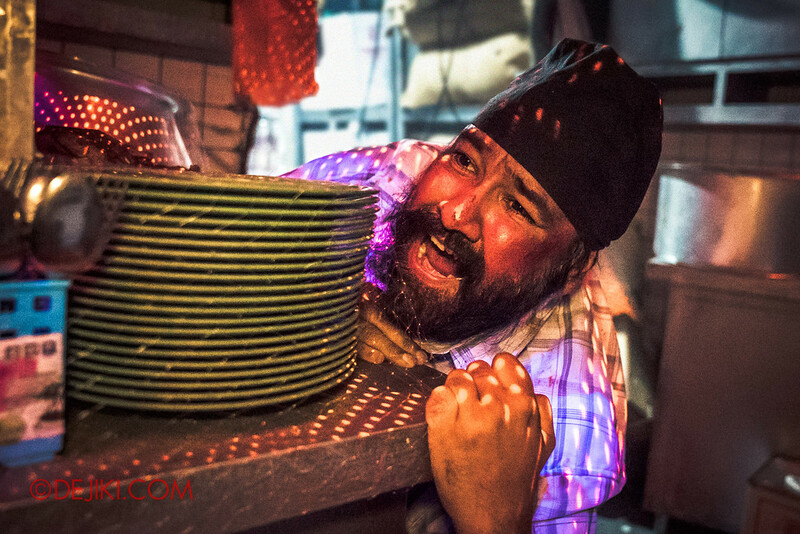 Tip: Look closely at the friendly ‘humans’ working at Hu Li’s Inn. 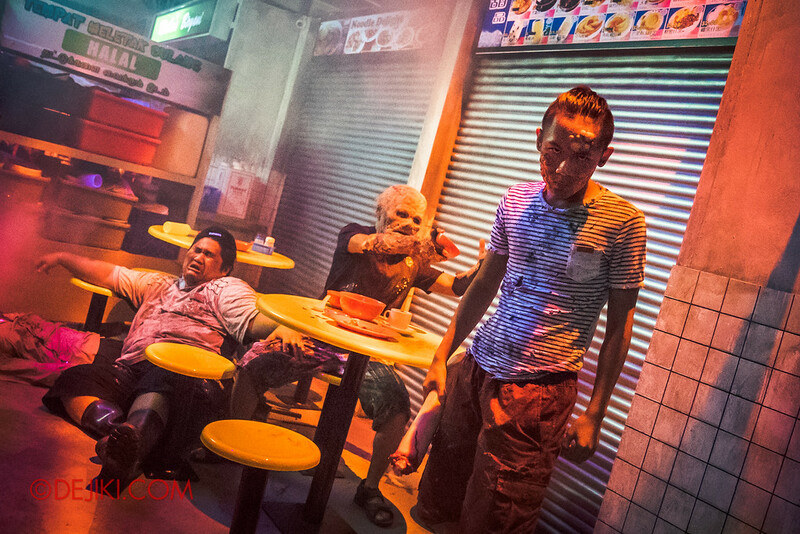 It’s die die must try gone wrong at Hawker Centre Massacre, when radioactive food poisoning sparks off an outbreak, turning people into flesh-eating killers. Those who have yet to turn are beyond terrified. It’s far too late to buy anything from the cluttered alleys, but it’s good to know that Ulu Pandan Hawker Centre is well stocked with sundries. While this haunted house is staged outside of Soundstage 28, it somehow has the detailing and atmosphere of typical ‘SS28 flagship’ haunted houses. The hawker centre feels airy and open, and the way the path weaves through cramped stalls and shops adds to the authenticity. Apart from the quite clean (and new) feel of this hawker centre, it has much of the sights, sounds and smells of a real place. Perhaps a few more nights will grime it up. 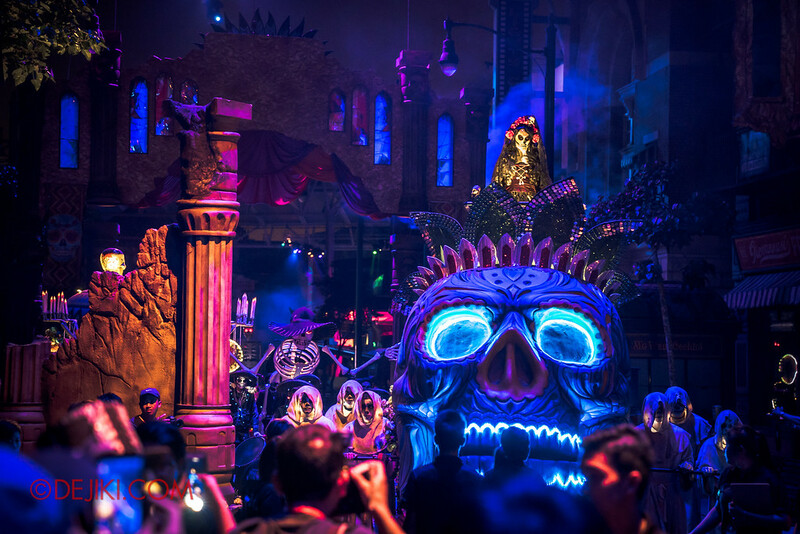 The sheer amount of props here is unbelievable – looks even far more than in the Siloso Gateway Block 50 (2015) haunted house. Tip: Stay alert while inside the shops, and don’t touch anything that’s glowing – it’s radioactive! 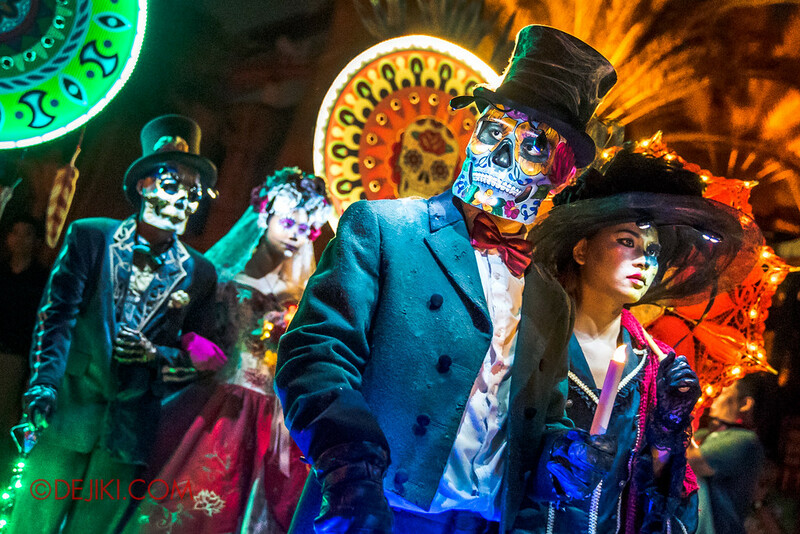 Based on Día de los Muertos (Day of the Dead), the March of the Dead scare zone celebrates Death and honours the departed. 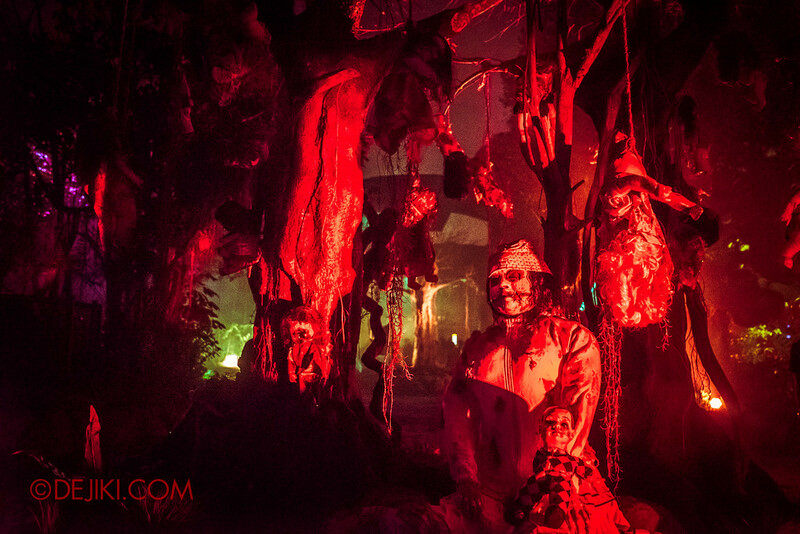 Without a doubt, this is one of the most beautiful scare zones ever created – just look at costume and makeup! 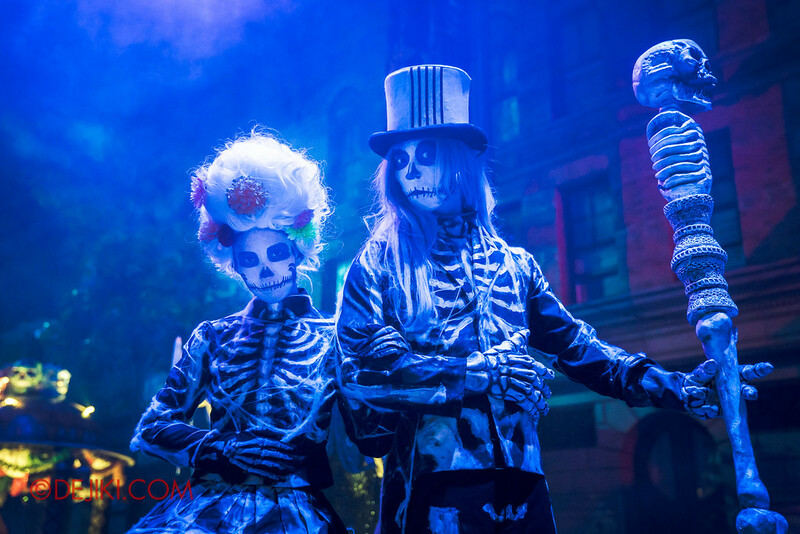 And you know it’s a major highlight of HHN6 when performers roam around the entire park as part of the Death March theatrical procession, with Lady Death in the lead. 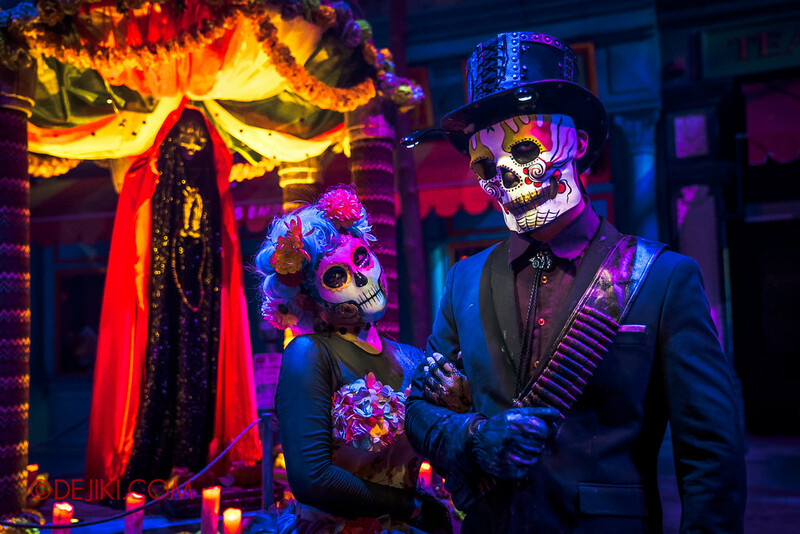 Dressed in their best and with calavera (skull) makeup and masks, the revellers observe the Day of the Dead festival in absolute silence and over-the-top seriousness. The movements of the performers are so delicate and elegant, and no one speaks. It’s a very mysterious scare zone. Somehow everyone is dressed to kill, and not allowed to talk about it. Lady Death celebrates her reign around the park during the Death March, a procession that starts from Ancient Egypt (anti-clockwise direction towards New York). It was announced earlier to be a carnival procession, but it seemed more like a funeral march. While a bit smaller than expected, it is still an impressive theatrical cavalcade. You’ll only see real action during The Resurrection street show. We might be spoiled by the non-stop action flick experience from The Invaders (2015). 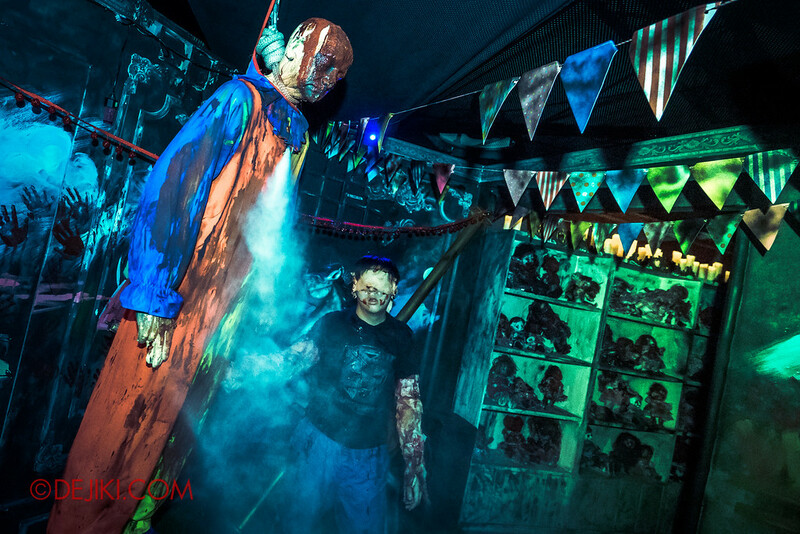 This scare zone lacks the bustle of a festival and is caught in a hypnotic pace. It’s a pity that the characters look amazing but their performance only brings out a somber, enigmatic mood. Excellent makeup and costuming aside, the scare zone could’ve been more generous with the props – logically the sets need to be smaller and mobile to accommodate the Death March, but without that performance, the scare zone felt empty. 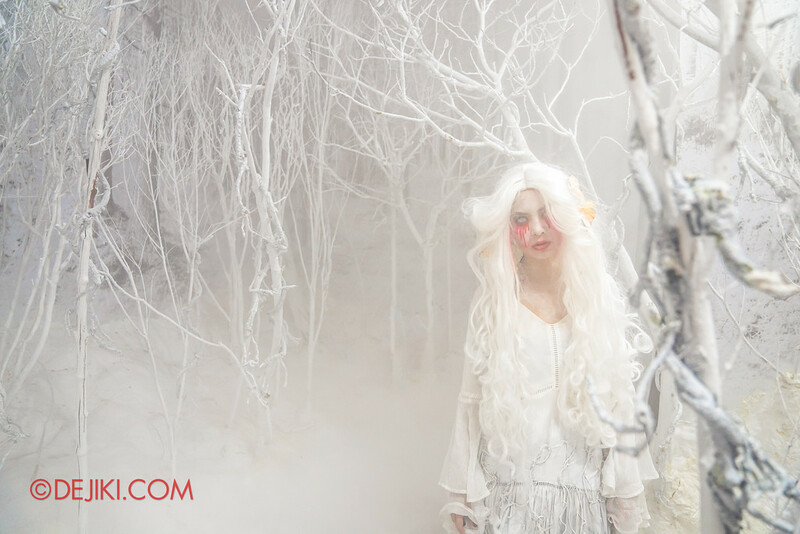 Those who love to take photos with scare actors will definitely love this zone, as performers move at a glacial pace and are always ready to pose. They even have LED lights shining on their faces! Perhaps the concept will be tweaked for the opening weekend. We will update the rating here if it does. Visitors to the Suicide Forest are not expected to return, as the evil spirits lingering in the woods drive them to their end. While it is inspired by the Aokigahara forest in Japan, Suicide Forest has several creepy forest stories rolled into one. There are some rather disturbing sights here, and the zone is a bit darker than the village of Hungry Ghosts (2015), so you better hold on to someone (make sure they’re real) if you’re easily startled. If exploring the spooky woods isn’t enough, there is a derelict train tunnel in the middle of the forest. We have yet to uncover the real evil within the forest. But I think we’re nearly there. 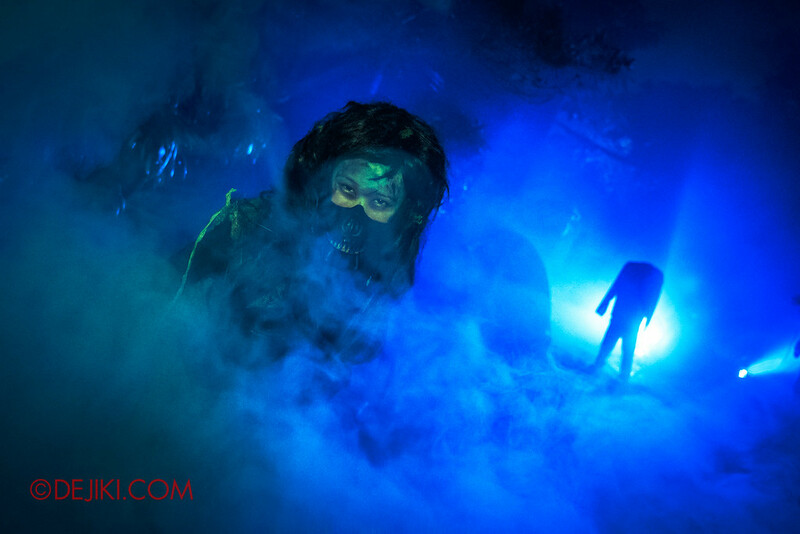 The Forest of Jurassic Park zone is creepy at night without any lights on, so this scare zone is naturally unsettling. At the moment the forest felt rather disparate with many sub-zones that didn’t seem to complement each other, unlike in the past 3 years. 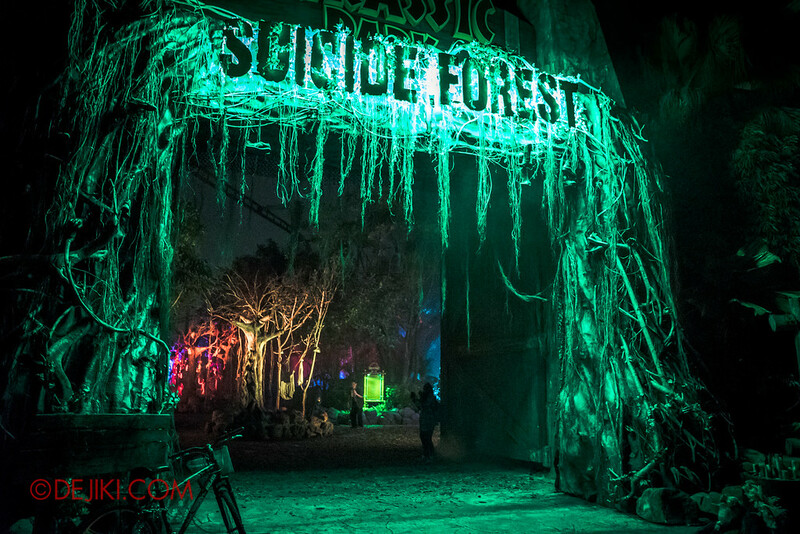 We may need to fully immerse ourselves here for a longer time to discover the true darkness within Suicide Forest. Jack is back! 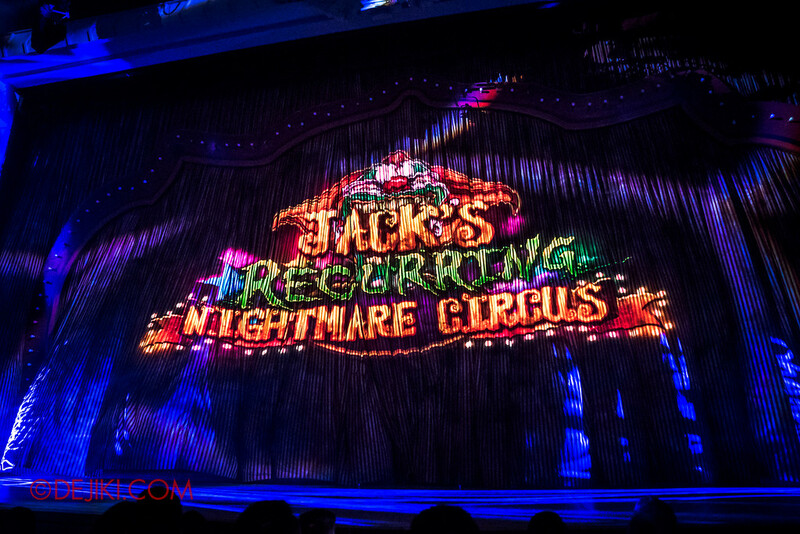 And he is putting up a new show: Jack’s Recurring Nightmare Circus. This is a refined version of the original Jack’s Nightmare Circus (2014). Some of the dance tracks were similar, but it was not merely cut and paste. Overall, the show is a lot tighter. 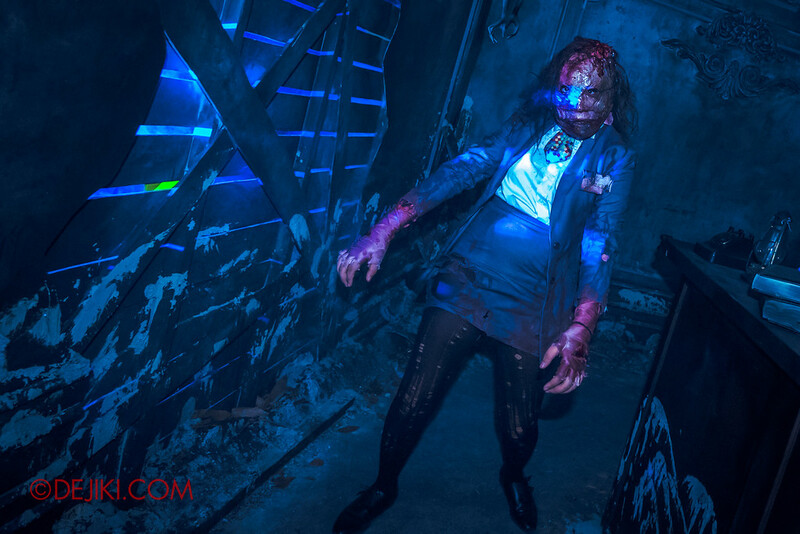 Chance, Jack’s right-hand woman, is missing from this show as she is the icon of HHN26. In her place is a new character – the one with the bob. With no Gordo Gamsby sideshow this year, Jack’s Circus will feature a highlight act from guest performers, which will be on rotation. The knife throwing act is Deadly Games from Season 11 (2016) of America’s Got Talent. I am pleasantly surprised at the show. It is much better than the original, which was entertaining but had a lull in between. There are no drawn-out dance segments in this one – they are just right. 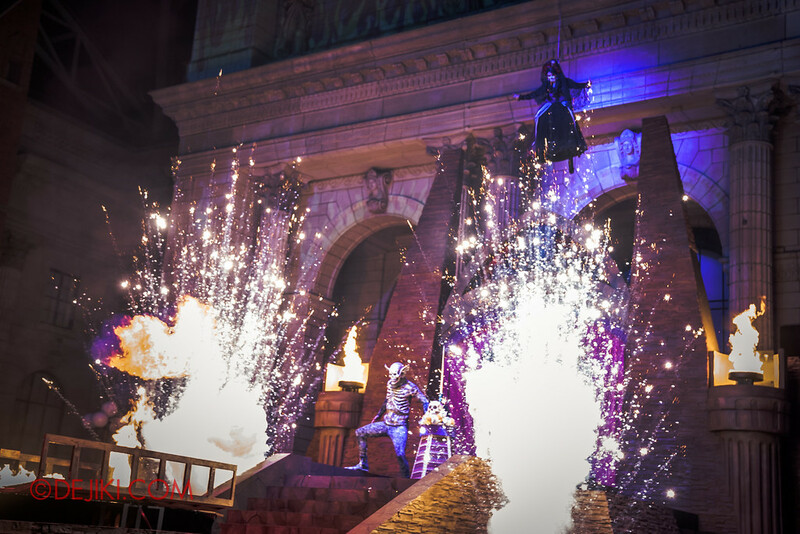 This year’s Opening Scaremony combines some of the best ideas from the past, with huge projections, pyrotechnics and an ensemble of performers toward the end. 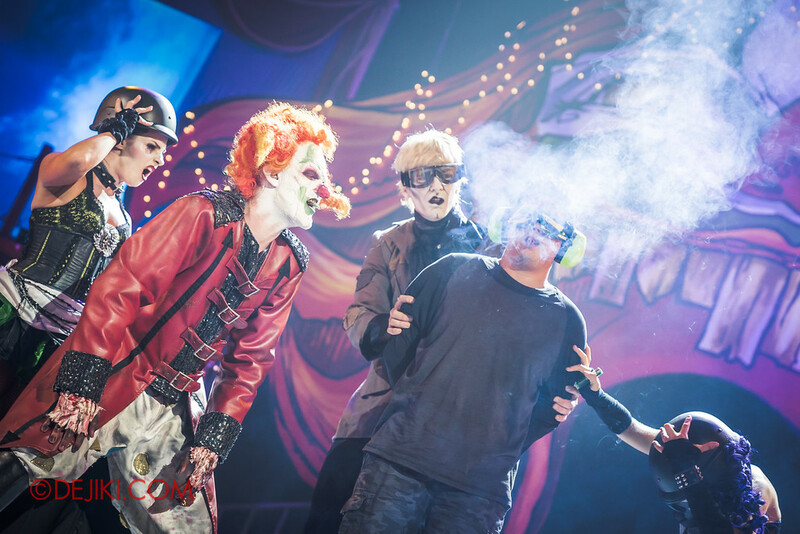 The show feels a bit lengthy, in fact we were glad that Lady Death cut the music abruptly – I’m sure HHN6 guests would be grateful that their HHN6 misadventures could start promptly as well. Congratulations, you have made it to the end of the HHN6 Review! Note: This review is mostly based on the Media Preview and Opening Weekend. Your experience may vary with crowd conditions and creative adjustments by the park. 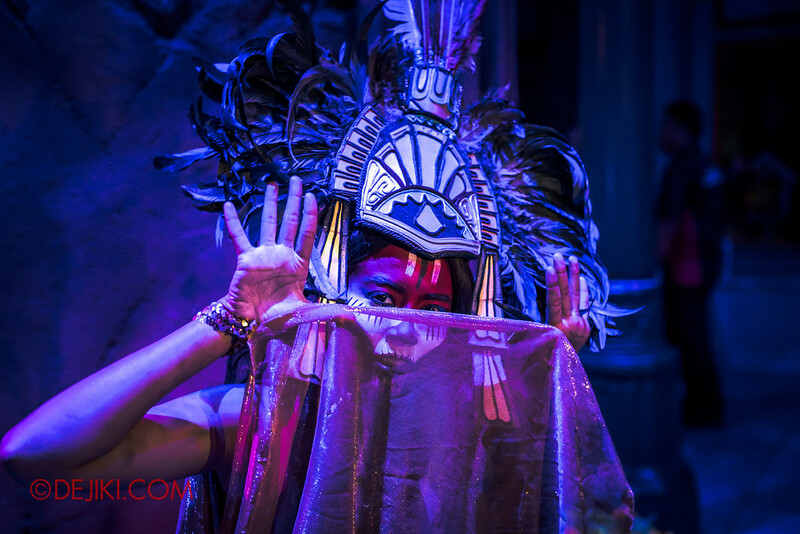 Special Thanks to Resorts World Sentosa for inviting Dejiki.com to the HHN6 Media Preview. I’d like to also thank my dear friends who were with me during the night – your energy kept me going! We will be at the park to cover Jack’s Recurring Nightmare Circus, March of the Dead: The Resurrection, and any updates to the scare zones and haunted houses in upcoming posts. 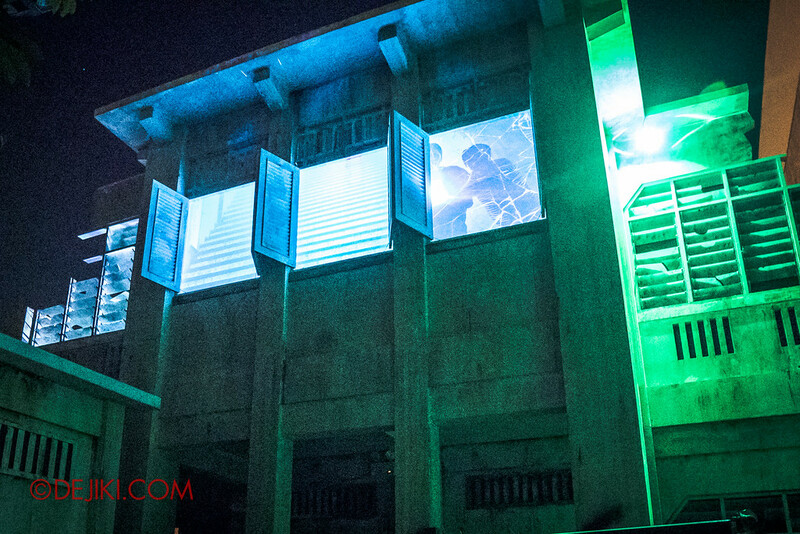 Reports on the event nights (wait times, happenings, crowds, etc) will be posted on our Facebook page when available. More Special Features will be published separately throughout October. Follow us (@dejiki) on Instagram, as we will be sharing a lot of exclusive photos of haunted houses and scare zones! 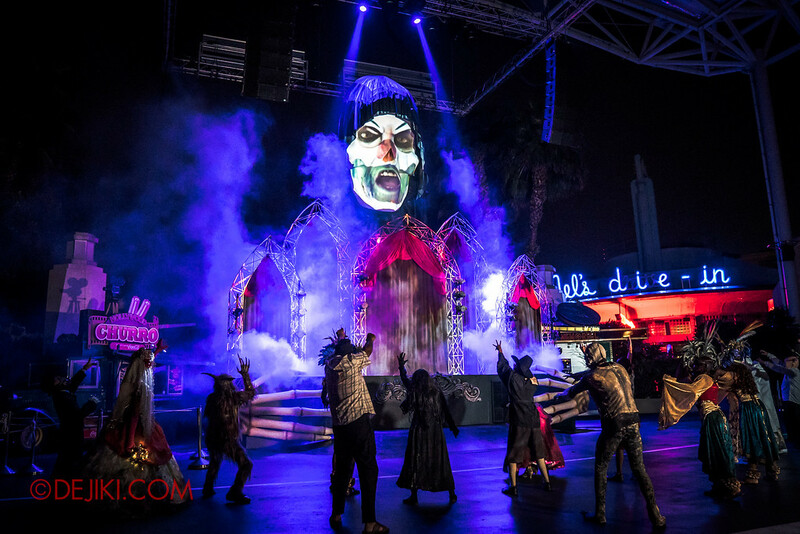 What do you think about HHN6? 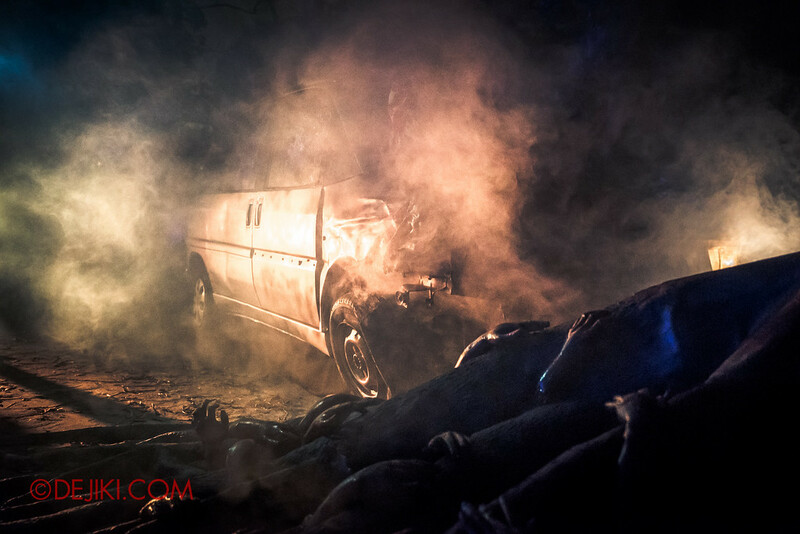 If you’ve experienced HHN6, we love to hear your thoughts! Drop us a message via comments here, or via our Facebook Page! Caught any killer snaps at the event? Share your photos with us! Simply tag us (@dejiki) on Instagram inside the photo, or drop us a message via the comments here. 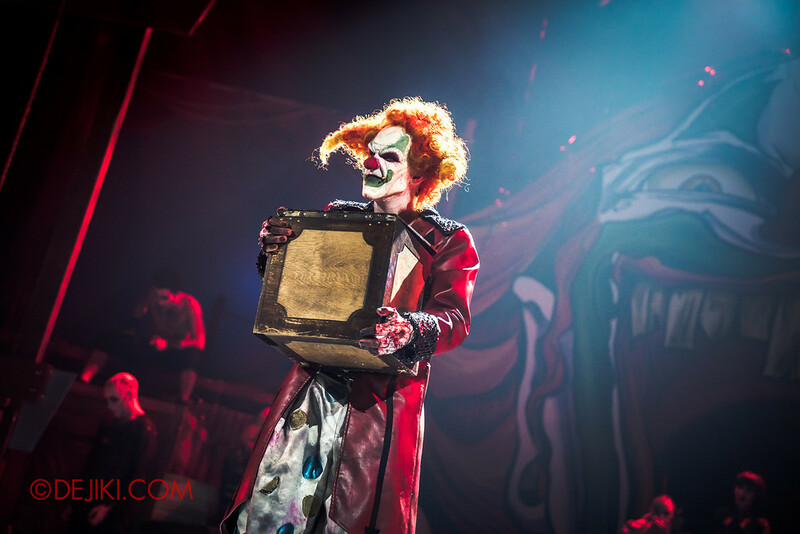 Have you bought your HHN6 tickets? Check our Event & Ticketing Guide. Our much-requested Survival Guide will be published very soon. Still no beating HHN4’s theme. I miss them demons. There wasnt enough time to get to all the haunted houses and watch the shows. Last year was better in terms of being able to immerse in the whole atmosphere and experience the horror night fully (most probably because there were only 3 houses, so the rest of the time was spent roaming the scare zones). This year’s theme is cool and different, loved it! Sadly there wasnt much time to experience the atmosphere fully due to lack of time (too much time spent queuing, chasing queues and couldnt spend more time in the scare zones). I was so glad I bought the express pass! It was really worth it to be able to bypass the long lines. So much creativity went into this production. Do you mind if I ask what’s the normal queue time for the haunted houses and other rides if you have and don’t have an express pass? I’d love another RIP tour review if possible, maybe more photos of the VIP areas and the buffet. 🙂 Your review for it during HHN5 was what convinced me to splurge on RIP tickets for me & my family so thank you for that! 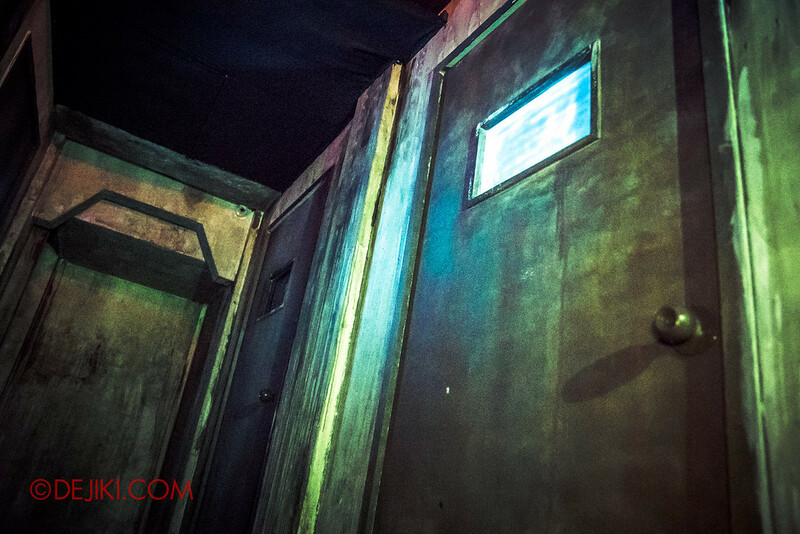 how about walkthrough other haunted houses….? Stay tuned for our photo tours of the other houses. I am a frequent pass holder. I want to comment about Jack’s Recurring has more than one type of circus show. First time was chair stacking show. Next was knife throwing act. Try it in different hours and you will find out. As mentioned in the post, the knife throwing and rola bola acts are in rotation. grouse was when we went through Hu Li’s Inn a second time, many of the scare actors were on their break so it was a bit quiet. 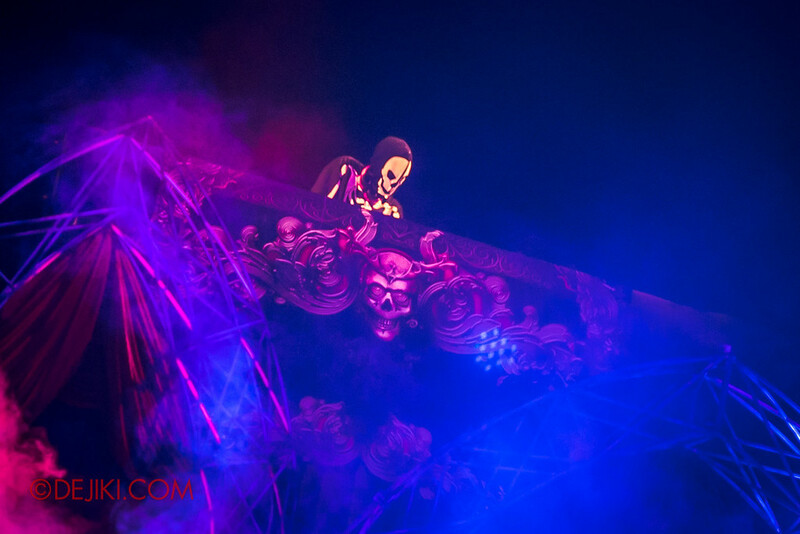 The March of the Dead was eeriely beautiful and the raised stage at NY for the show was also a good choice, better than last year’s Invaders which had tooo much happening. Just came back from HHN6. One word, AMAZING! 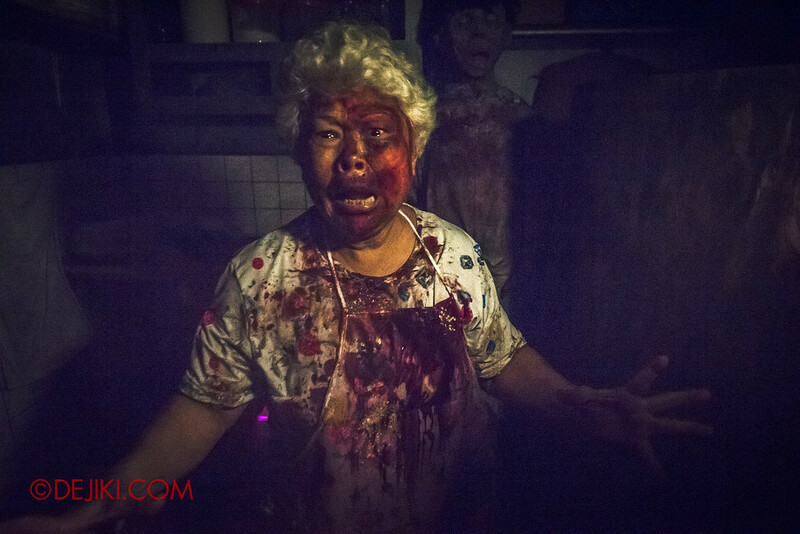 While last year’s Haunted MRT came out tops for me, this year, Hu Li’s Inn, Old Changi Hospital and Hawker Centre Massacre were definitely mind-blowing. March of the Dead gave me a chance to delve into my favourite topic, SKULLS and Sugar Skulls especially so. 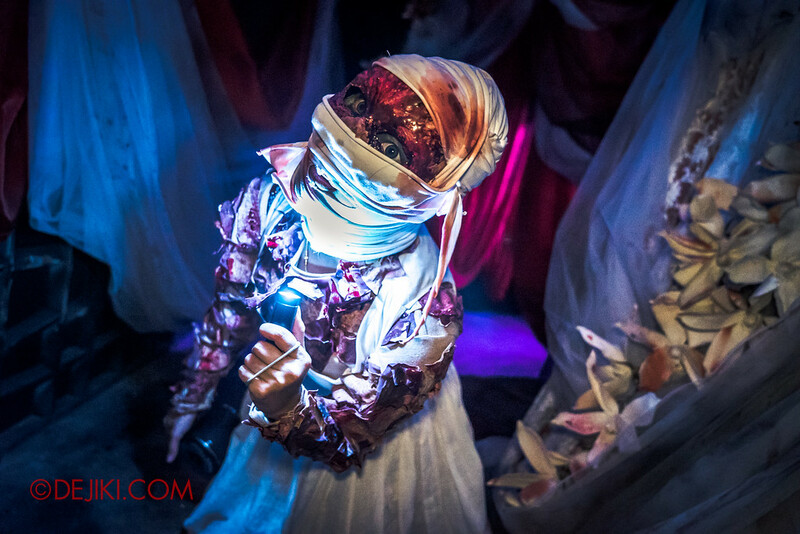 The face-painting was meticulous and the costumes were epic! Whoever thought to put lights on the character’s face to illuminate them, you’re a GOD, it was easier to photograph them (and be photographed WITH them). Yes, queue’s were long and hot (dress appropriately and skip them heels ladies, and bring a face towel to mop up the sweat; wet tissues just means more litter. Oh and for the love of gawd, shower and put on deodorant people!) and if you didn’t buy or couldn’t afford the Express Pass / Plus or RIP tours, please don’t spit on those who could, it’s very unbecoming. Suicide Forest was a tad disappointing; just a tad, not much and Salem Witch House was so-so. Don’t forget the rides! If it’s too warm, take the Revenge of the Mummy (sans express pass) and cool off in the AC enclosure (your other option would be Transformers: The Ride). 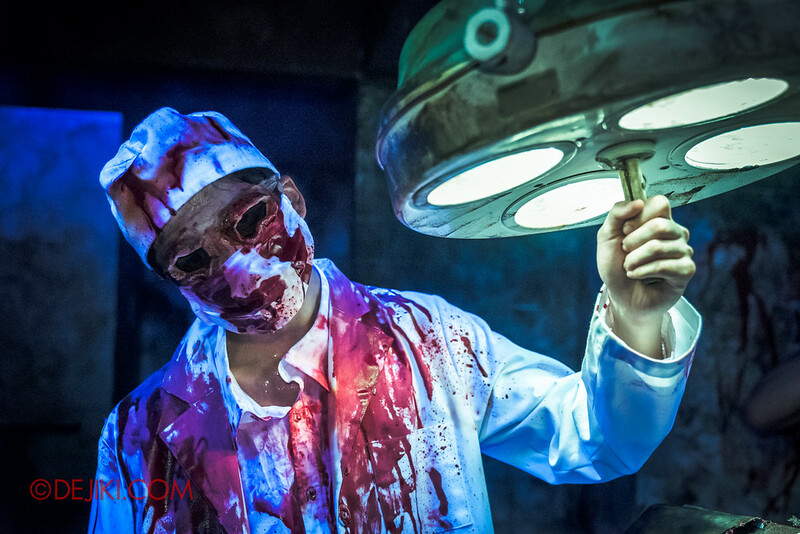 Felt disappointed for this year HHN, i think there is only 3 quarter of scare actor compared to last year HHN. No doubt the decoration are nice, but they should place more scare actor around the park to scare people so that we can scream or hear people screaming all night round. Agree with aidil, if you came in here like a douche and just laugh around, whats the point of coming. We paid the money to feel the thrill of jump scare. How long is the queue if you’re not getting the express pass? Because the pass costs like 80 dollars which is ridiculous, as it is more expensive than the admission ticket. Express Pass are dynamically priced to demand, and can go above $110.